Over the past year I’ve thought a lot about switching from roads to trails, but I have either been too intimidated, or nervous about switching routines in the middle of marathon training. But with the marathon behind me, a new year in front, and a perfect opportunity to try something different, I’ve decided to take on this new challenge. What I’ve quickly come to realize is that there is nothing more pure than running alone through the rugged outdoors. It is refreshing, exciting, and has given my running a much needed rejuvenation. So what exactly is a trail runner? Simply put, it is running on a trail instead of the road or paved path. What I’ve learned as a beginner, is that it is much more than just that. You’ll find a typical trail is a hiking path, complete with the questionable footing, narrow passage ways, extreme elevation changes, and everything else one thinks of when describing a hiking path. What that means for a runner is that your strides must be shortened, you must prepare to be lighter on your feet, and your pace will often slow and become inconsistent as the elevation changes. What makes it appealing? This is an easy one. What isn’t appealing about leaving the traffic, crowded sidewalks, and noise of the big city behind, and running through the trees, mud and relative quiet? Aside from the mental cleansing, trail running is also good for those joints. The pounding of the road can really mess up your legs, but the softer landing of a dirt trail will help ease that pain and prevent injury. What equipment is needed? Well, nothing really. One of the best parts about trail running is ditching everything and just being out in the woods. Many runners will get a pair of trail shoes, designed for the different terrain, but that isn’t a necessity. You may also want to think about water before heading out in the woods, which is not as easy to come by as it is on the road. Remember that you will probably get dirty, regardless of how much rain you’ve had recently, so be prepared for any pants/shorts/shoes to come back ready for a wash.
Is it very different than running on the road? The major differences you’ll find have to do with footing and elevation changes. The simple fact that the surface often is uneven, forces you to slow down and take shorter strides. This can be difficult at first to get in the habit of, but for me has made running a lot more enjoyable. Allows me to slow down and smell the roses, if you will. When it comes to elevation changes, they can really be tough. I’ve found myself power walking up some steep climbs, and that is okay. Trying to run up everything can really kill your energy levels in the long run. 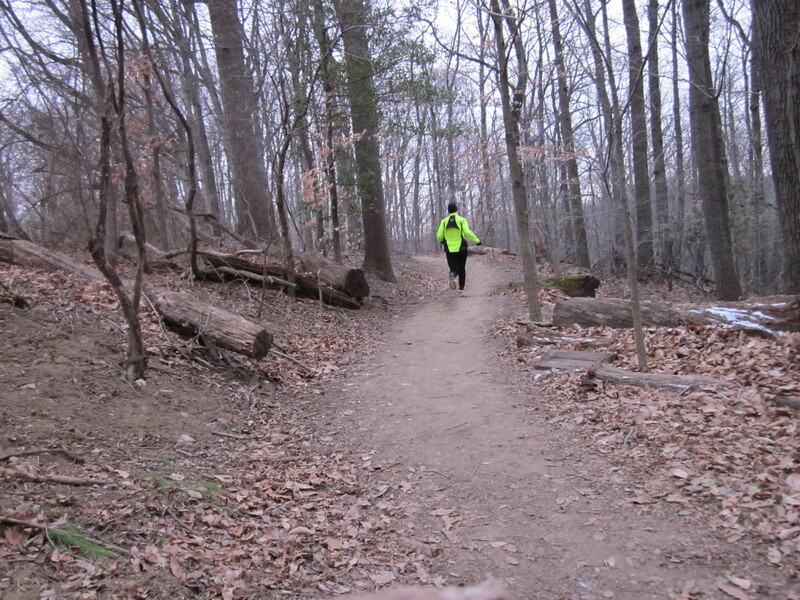 Trails in Washington, DC: Consider this a short list of easily accessible trails for new trail runners right here in the District. The city and its surrounding areas offer miles and miles of unpaved paths that I’ve yet to explore. As I’m running these trails, I will continue to update this list and write separate posts highlighting each trail in more detail. Keep your eye out for some great photos and interesting footage of the trails. Rock Creek Park (map) – Most runners in DC take advantage of Rock Creek Park, and if you don’t, you really should. The National Park offers some great running and biking trails mostly along the creek, giving beautiful views and a much needed 3 or so degree temperature drop during those dreaded summer runs. Most people, however, seem to stick with the main paved Rock Creek Trail which runs all the way from Virginia to Maryland. It was on this paved path that I, along with thousands of others, clocked most of my Marine Corps Marathon miles. It is great for bikers and joggers, but isn’t for trail runners. Fortunately for us, Rock Creek Park offers more than just the main trail, and miles of unpaved, rugged, dirty hiking trails. Western Ridge Trail (marked in green, blazed with green): The Western Ridge Trail is one of the more popular hiking trails through Rock Creek Park. Offering just under 5 miles of trail, this route will take you up and down the ridges offering views of the river and surrounding area. The trail itself switches a few times between hiking and biking during the first few miles, then ultimately to a shared hiking/horse trail for the last third or so. For the most part the trail is well marked and well defined, with moderate terrain. Once you move past the first section, the trail widens a bit with better footing. This is a great trail to try out on your first few runs, especially the section between picnic area 28 and Military Road. Valley Trail (marked in pink, blazed with blue): This wonderful trail runs along Rock Creek up to the Maryland border for about 5.6 Miles, but don’t be fooled by the word “Valley” in it’s name. This trail has plenty of elevation change as it twists and turns along side the river. Contrary to the Western Ridge Trail, the Vally Trail’s path is a bit more rugged. You will often find rocks, roots and narrow passages causing uneven footing. This is one of the things I love most about this trail, but forces a much slower pace. C&O Miles 0-10 (map): You can easily pick up the C&O from right inside the District. Traveling as far south as you can go from just about any street in Georgetown will take you down to the water where you will pick up the path. You may also access it from the Rock Creek Trail just after passing under (going south) the Pennsylvania Ave bridge. After running the brick sidewalk through Georgetown, you will reach the actual path and boy is it flat. This stretch is wildly popular on a weekend morning for marathon trainers, weekend joggers, and the like. During the summer you’ll pass several impromptu aid stations from Team In Training and other similar training groups. If you look out on the water, you’ll often see crew teams doing their morning workouts, and kayakers playing around. While you don’t really need to worry about footing along this trail, it is a great way to get off a road, into a bit of wilderness, and help save those legs and the mind. the wave rider is a good shoe. also, try not to get eaten by monsters in rock creek. You got me into the wive rider. I love that shoe. Thanks for the heads up on the Monsters. I’ll be sure to keep a watchful eye over my shoulder.